This instrument of 43 Stops and 56 Ranks of pipes is the 37th new organ built by Buzard Pipe Organ Builders of Champaign, Illinois. The Buzard firm had been selected as the Church’s builder of choice in 1991, when plans were first developed to build a new Sanctuary. In recent years, when the original Victorian era building was found to be structurally unsound, the desire to design and construct a new Church building acquired a new sense of urgency. 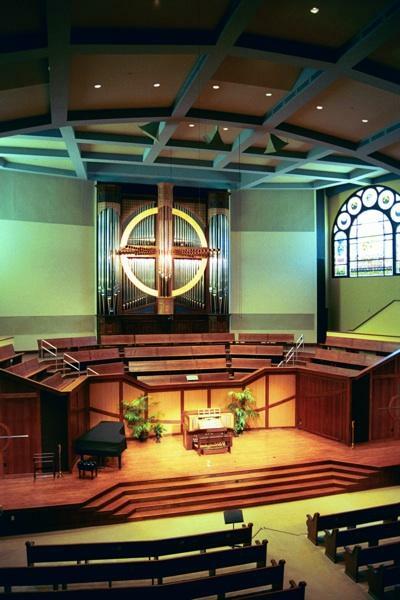 The decision to include a pipe organ in a very modern building in the context of a very modern ministry was not made lightly nor easily. The wisdom of the Church leadership held that worship styles both timeless and modern needed to be embraced wholeheartedly. The organbuilder and architect enjoyed an unusually collaborative and collegial relationship in the design of the entire building as well as the new instrument. The new Sanctuary was completed in 2005, and the new organ arrived in June of 2008, giving the construction dust plenty of time to settle. 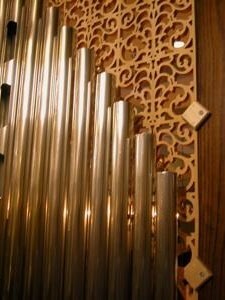 Although the room’s acoustics are more absorptive than we would have preferred, sound is heard evenly and in balance throughout the room.The organ’s dramatic visual design is intended to be a stylized rendering in organ pipes of a Celtic Cross. The background fields of Great and Pedal Diapason and Principal pipes are made of polished tin. The pipework elements of the cross itself are polished copper Pedal Principals and the horizontally mounted Festival Trumpets. The giant blocks of white oak which hold the Festival Trumpet pipes are clad in polished copper, to emphasize the cross’s horizontal arms. The circle which binds the four arms of the cross together is a 16-foot diameter ring of Baltic Birch, leafed in 24 karat red-gold.The instrument is housed in a solid white oak case standing three stories tall, by 24 feet wide, by 12 feet deep, flanked by walls which act as projection screens. The pipe shades are of basswood. Some of the small panels are enameled in Indigo, which accent color is also found in the stained glass windows. It is located on the axis of the Church, above and behind the choral singers, to provide optimal projection of sound to the congregation and choir, and to be a living and integral participant in the Worship Service and the Church’s interior design. 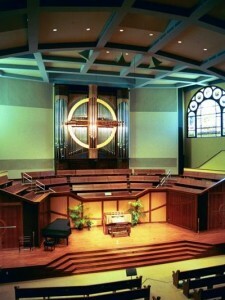 A closed-circuit remotely-operated television camera is mounted between and just behind two pedal façade pipes so that worshipers can see themselves projected on the screens.The traditional portion of the Church’s enviable music program includes everything from children’s choirs through a large adult choir, small instrumental ensembles through full symphony orchestra performances. And of course the organ has to support congregational singing and excel in its solo role. Therefore this instrument had to exhibit an unusually wide dynamic range to accommodate musical needs of every size and type, but also the classic disposition which allows an organ to play the literature. The organ possesses a singularly noble and majestic tone quality. Each division is based upon sub-octave pitches, and the voicing is full and warm. 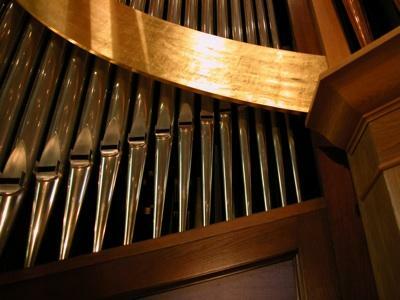 The Great and Pedal Organs feature First and Second Diapasons, and all the divisions iinclude a wealth of warmly voiced 8′ stops to provide a rich variety of accompanimental colors at several volume levels. The design includes full couplers at 16′, 8′, Unison Off, & 4′ pitches for increased flexibility. 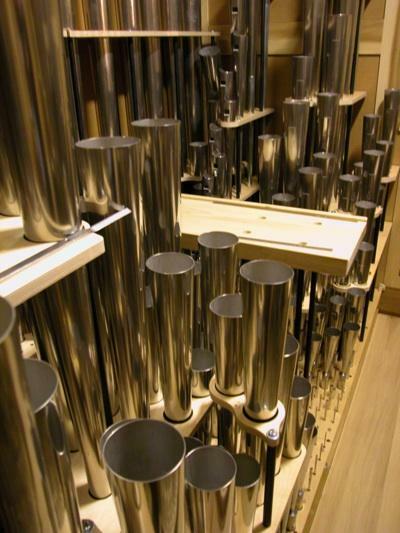 Although the instrument sounds very big when everything is coupled, or when the high pressure Tubas or Festival Trumpets are used, (excelling in its occasional role with a full symphony orchestra) the organ itself is not inherently loud. It can be as delicate as a child’s voice. 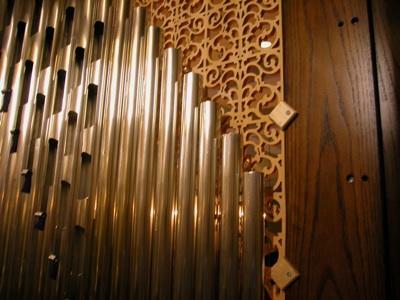 Its sound fills the worship space gracefully, without having to yell to make its point. 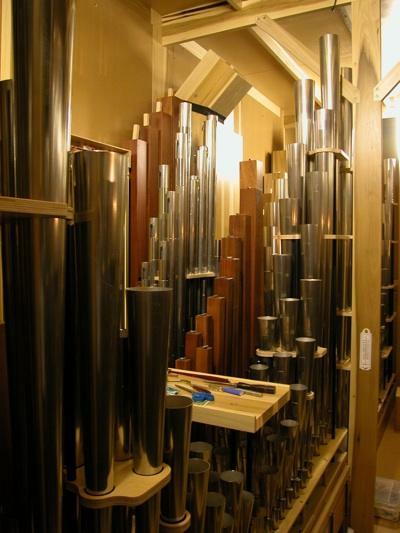 Buzard Organs have become known as exceptional accompanying organs, which is the primary use to which pipe organs are put in modern worship services. But, by virtue of an historically and nationalistically informed point of view, Buzard Organs also musically render the entire solo repertory from early contrapuntal styles through the most modern symphonic transcriptions. Our Principals have something to tell you. Their choruses are clear, but meaty. Flutes are singing and liquid, strings are warm and harmonically interesting. Chorus reeds add varying degrees of “clang” to their divisions: for example the Swell 16, 8, & 4′ reed battery is of authentic French construction, the typically bright and bold sound tailored to this division’s classic musical character, whereas the Trompete on the Great is darker. 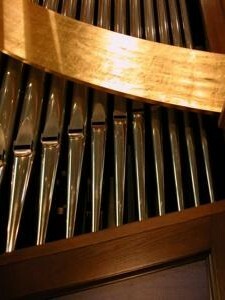 Trombas appear on most of our Great Organs as extensions of the Pedal Trombones (a Willis trick), which offers the organist two degrees of reed color and volume, depending upon the musical context. Our solo and pedal reeds take more of an orchestral approach: smooth, round, warm, and always interesting, whether soft or loud. Our metal pipes are all made of high tin-content pipe-metal, planed and polished. 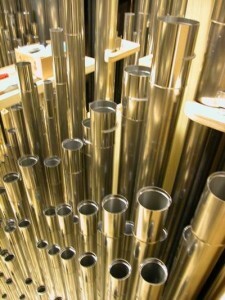 The reeds use either this rich pipe-metal or wood for their resonators. In this organ the 32′ Contra-Trombone resonators are white pine and full length down to low FFFF#. 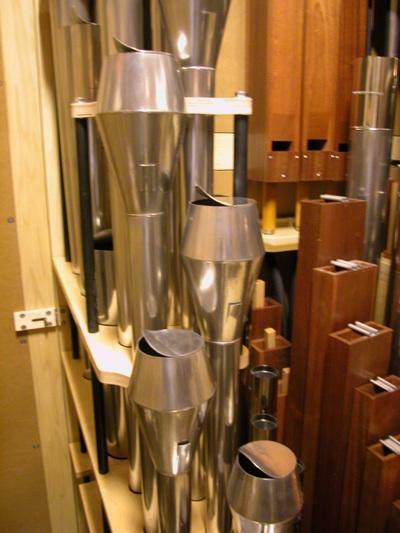 The wood flue pipes are made from poplar or mahogany with cherry mouths. All Buzard organs employ Slider and Pallet windchests to eliminate long-term maintenance, and provide superior tonal blend and tuning stability. 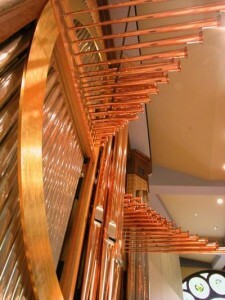 All Buzard Organs employ wooden winding systems to reduce turbulence and noise, and Schwimmer regulators at each slider chest to provide a steady wind supply. 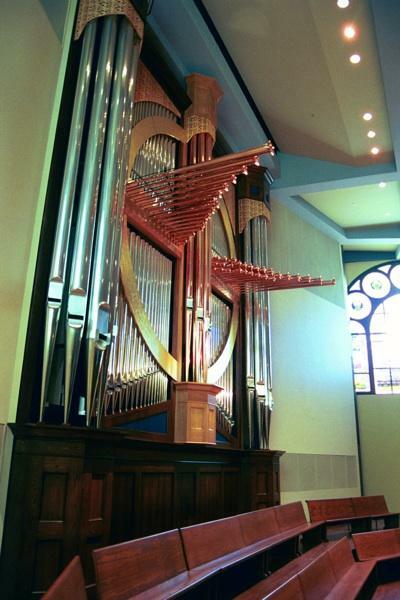 The instrument was dedicated in public recitals by Organist Emerita Doris Hill, Concert Organist Ken Cowan, and Mr. Cowan’s student and the Builder’s son, Stephen Buzard. 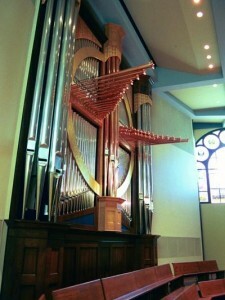 A new CD featuring Stephen Buzard playing this organ has been released on the Delos label. Selections from this CD are included as sound files in this page of the Gallery. Enjoy!